Potato (88%), Vegetable Oil, Corn Flour, Salt. Preheat oven and oven tray to 210 fan forced for 10 minutes. 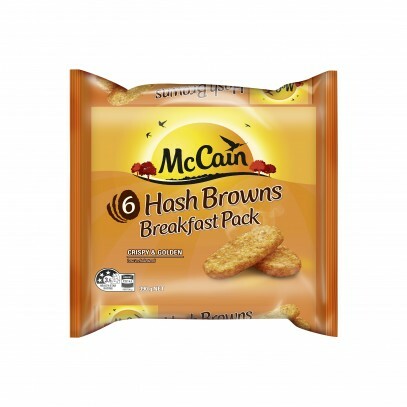 Spread your McCain Hash Browns in a single layer on the preheated oven tray and place in the top half of the oven. Cooking times may vary from oven to oven. Adjust the cooking time to suit your oven and preferences. The following cooking instructions are for a full tray of McCain Hash Browns. For smaller quantities reduce the cooking time accordingly. For best results cook from frozen. Do not overcook and watch carefully during the final minutes of preparation.